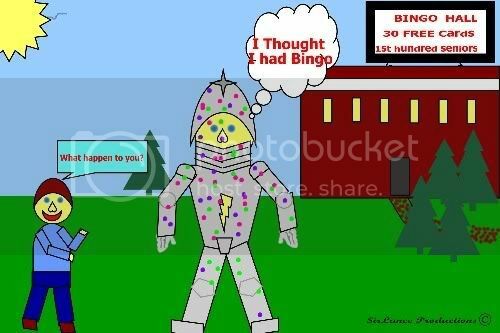 Thought I would try my hand at making a cartoon...It is my first.. Made it with Picture it 7... Made from shapes.. Too hard for me to draw with a mouse... LOL Chris..
omg great job too funny....the suit of armour is in case she dont win?????????? Good Job I wouldnt have the patience doing it with shapes either. Where did you get the software from, you know any pirates?? VERY FUNNY!!!! 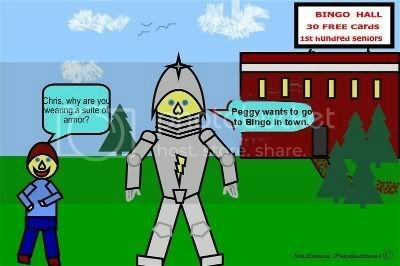 LIKE THE SUIT OF ARMOUR!!! GOOD JOB!!! lol, love it! I'll move it to the cartoon section later. You did a great job. It is a great cartoon. Thank you for taking the time.